Historic site No,133 (743,Kanchung-ri, Kanghw-up,Kanghwa-gun ) This was the loyal palace site of Koryo Dynasty when Koryo was fighting against Mongolia for 39 years. King Kojong of Koryo(reigned 1213~1259) moved the capital to Kanghwa Island and completed the construction of the loyal court and government building in 1234. After return of the government to Kaesung by the reconciliation of with Mongolia in 1270, the loyal court and the castle were ruined. 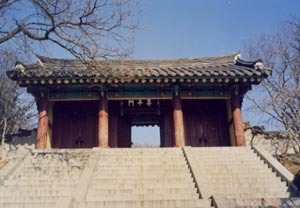 In the Choson Dynasty, there were a royal vill and the headquarters of Kanghwa Garrison in the castle, but only Tonghun (an Office of local administration)and Yibang-Chong (an Office of Secretary and Personnel) are remained.